Marshall Matsveru and Pierre Pretorius with the ‘Dung Beetle’, a device that turns plastic waste into gas or biodiesel. The invention will make its debut at the AfrikaBurn festival in the Tankwa Karoo next month. From building alien spaceships on the set of the film District 9 to setting up his own hydroponic system at home, innovator Pierre “Pops” Pretorius always had an idea floating around in his head. Now the Limpopo-based professional set builder, whose rough, oil-stained hands tell the story of decades spent building and creating, has completed his “most complicated and best” device – one that turns plastic waste into energy for your home or vehicle. 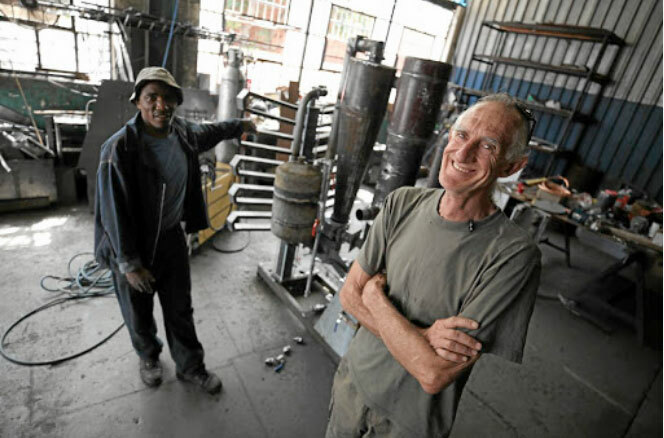 Using borrowed factory space in the south of Johannesburg, some basic tools and lots of spare parts, Pretorius, 58, with the help of a few locals, is putting the final touches on the third generation of the Dung Beetle – a kind of reactor that transforms rubbish into riches in the form of energy. Pretorius and his team are working tirelessly to finish the machine, which takes ubiquitous single-use plastics such as cold-drink bottles, straws, plastic bags and food packaging and turns them into gas and biodiesel through a gasification process. start-up. All the contents of the gasified plastic, including the smoke and the carbon chains, are contained. The owner of the factory that Pretorius uses, Mike Jervis, described the Dung Beetle as “taking Nasa [technology] and making it backyard”. It can produce between 15kW and 20kW of fuel while processing about 15kg to 20kg of plastic an hour. “That’s enough to power four modern city homes,” said Pretorius. Although the technology is not brand new, Pretorius says the Dung Beetle represents the first time the process has been within the reach of ordinary people. He hopes to share it with South Africans in need. The idea started when Pretorius wanted to get his hydroponic farm, where he and his wife Roanne grow their own food, completely off the grid. Using a method he downloaded from the internet, Pretorius built a wood gasifier, which converts timber or charcoal into gas. Pretorius, who has no formal scientific or engineering training, then bought generator parts and built his own gasifier for single-use plastics. 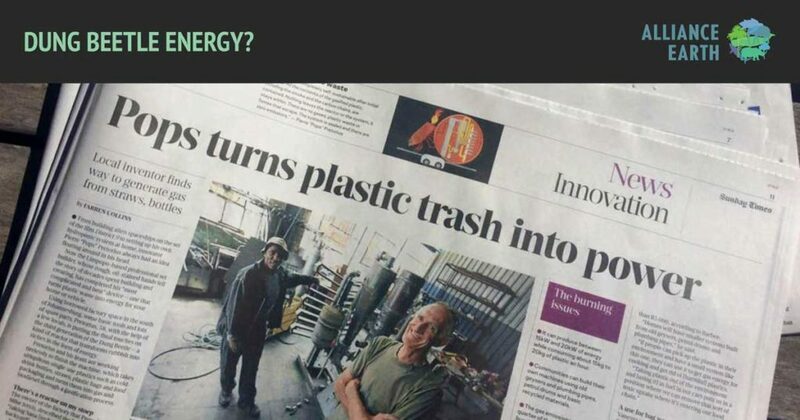 The resulting gas is used to power his farm. Jeff Barbee, director of the US NPO Alliance Earth, recently partnered with Pretorius to refine the Dung Beetle and make the technology available to communities. With the help of a grant from the annual Tankwa Karoo arts and music festival AfrikaBurn, the pair are turning the machine into an educational art platform “to take into rural communities and get people to understand how the system works so that they can build it themselves”. All the designs for the machine will be open source and one can be built for less than R5,000, according to Barbee. It can produce between 15kW and 20kW of energy while consuming about 15kg to 20kg of plastic an hour. Communities can build their own machines using old geysers and plumbing pipes, petrol drums and basic recycled materials. The gas emissions are one quarter of those produced by burning propane. “Homes will have smaller systems built from old geysers, petrol drums and plumbing pipes,” he said. “If people can pick up the plastic in their environment and have a small system like this one, they can use it to get gas energy for cooking and get rid of [harmful] plastics. Vanessa von der Heyde, from the Sustainability Institute near Stellenbosch, said single-use plastics were some of the most environmentally detrimental wastes, and were also extremely resource-inefficient relative to their lifespan. “South Africans are starting to take more stringent measures, and we are seeing a groundswell in civil society and organisations that are tackling the issue of single-use plastics, such as bags and straws,” she said. According to the environmental group Strawless Ocean, more than 500 million plastic straws are used every day in the US alone, and most of those end up in the sea. It says an estimated 71% of seabirds and 30% of sea turtles have been found with plastics in their stomachs. The World Economic Forum says eight million tonnes of plastic ends up in the ocean every year. Last year a team of scientists from the Council for Scientific and Industrial Research’s polymer and composite research group in Port Elizabeth broke new ground when they developed 100% biodegradable plastic bags made from agricultural by-products. The Dung Beetle is set to make its debut at AfrikaBurn next month before going on tour to communities around the Western Cape and Limpopo. This entry was posted in Environment and tagged Dung Beetle, Green Energy, Jeff Barbee, Pierre Pretorius, US NPO Alliance Earth. How can I get my hands on the design of the System. It sounds very impressive and interesting. Thanks so much for the kind words, we are still working on the open source design as well as how we will release that and make sure it is implemented safely and with the right kind of feedback and support. As developments happen we will post them up here and also release them in our upcoming newsletter.